My hand cupped the lens. My eye peering through the view finder, searching. Searching. I let the camera strap rest around my neck as the camera dangles and I look for her. Green and white striped shirt. Her back to me. Walking away . . . . down the corridor. She turned around and looked at me, but only for a second. Quickly, she swung her head back around and weaving herself into the massive crowd, she became lost in it. We as in me. Her four sisters. And him. And I want to say, it’s only growing pains. That all kids go through this “I’m embarrassed of my family stage” but I don’t care. Those other jokers might be, but I’m not. And my feelings get hurt. Like the love of my life doesn’t love me back. So I let her walk away. And I sucked back my tears. I love her, but I can’t make her love me the way I want her too. Like 300 seconds later, she came back. And let me take pictures of her and her artwork. She won a contest for the Houston Rodeo. Some of my other favorite winning pieces. . . I know, I know. I’m a bit dramatic. But sheesh. I don’t know what is up with that chic. This morning we had a heart to heart. I told her that my love is her security. That her father and I love her and will always protect her and that maybe she’s. . .hormonal. Like I am when I yell for no reason. I shrugged my shoulders with no other explanation. For one tiny milli-second I saw some recognition. Then it was gone just as fast as it came. It’s like there are crazy layers in that child’s heart. Like she’s a magnificent Mexican Lasagna or something. Soft and mushy, with creamy loveliness. . . . like ricotta. Other times, green and soggy if you don’t squeeze out the excess water in the spinach. Sure there is some spicy Italian sausage in there too. . .but really, that is where the real sauciness come in. Her real character and flavor. But, always at the center of it ALL. . .
At the bottom. . .
And at the top. . . Completely real, understandable and relatable. You know? I’m betting that her heart will always be grounded in tortillas. Let my babies heart remain a tortilla. And you better hope your ‘snook-ums’ heart remains a tortilla too. 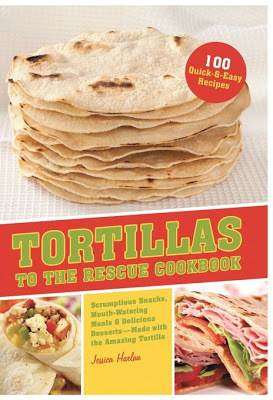 TORTILLAS TO THE RESCUE COOKBOOK. Scrumptious Snacks, Mouth-Watering Meals & Delicious Desserts – Made with the Amazing Tortilla by Jessica Harlan. This book will give you over 100 quick and easy recipes to show you how to make amazing tortilla creations. Not crazy hard to work with noodles. Totes delish. See recipe below. But before you go whipping it up and discovering the answers to love and world peace. . . .
One entry per person, please. Or I will come to your house and go through you refrigerator and show you how each and every one of your perishables relates to love, peace, and world harmony. And it’ll take a long time. Even if all you have is Diet Coke and limp celery. And the winner is. . .. Comfort food like roast beef or fried chicken. Please contact nickiwoo.thehomeguru@gmail.com in the next 48 hours to collect your prize, or another winner will be chosen. Now! Layers of delicious love in the form of tortillas. . . . . . .
Reprinted from TORTILLAS TO THE RESCUE COOKBOOK © 2012 by Jessica Harlan. Permission from Ulysses Press. 1. Preheat the oven to 375 degrees F. In a large saucepan, heat the olive oil over medium-high heat. Add the onion and cook, stirring occasionally, until softened and translucent, 5 to 7 minutes. Add the garlic and cook, stirring frequently, for 30 seconds. Add the tomatoes, cumin, chipotle powder, 1/2 teaspoon of the the salt, and 1/8 teaspoon of the pepper. Bring to a simmer, then reduce the heat to low and cook, stirring occasionally, for 10 minutes. Remove from heat, and let cool slightly. 2. In a large nonstick skillet, cook the sausage over medium heat, breaking it up into small chunks, until browned through, about 7 minutes. Remove from heat, drain the excess fat, and set aside. 3. While the tomato sauce and sausage are cooking, lightly beat the egg in a medium bowl. Stir in the ricotta cheese, 1/4 cup of the Parmesan cheese, the remaining 1/2 teaspoon salt, and the remaining 1/8 teaspoon pepper. 4. Spray a medium baking dish (about 11 x 7 inches) with cooking spray. Spread a spoonful of tomato sauce over the bottom of the pan. Dip 3 Tortillas in the cooled tomato sauce, and tearing to fit, line the bottom of the pan. Spread about half the ricotta mixture over the tortillas, then sprinkle with half of the spinach, half of the sausage, and about 1 cup of the mozzarella cheese. Create more layers with more dipped tortillas torn to cover the mozzarella cheese, the remaining ricotta cheese mixture, and the sausage and spinach. Sprinkle with 1 cup of the mozzarella cheese. Create a third layer of dipped tortillas. Spoon the remaining sauce over the tortillas to cover, sprinkle with the remaining 1/2 cup mozzarella cheese and the remaining 1/2 cup mozzarella cheese and the remaining tablespoons Parmesan cheese. Bake until the sauce is bubbling and the cheese is melted, 40 to 50 minutes. Serve hot.